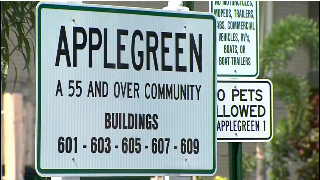 MARGATE -- The Applegreen condos in Margate are a lot like other complexes, seemingly rundown with crumbling door frames, holes in the walls, cracks in the ceilings, lousy laundry machines and a lot of residents wondering what they are getting in return for their monthly maintenance fees. "I call management, he never have a solution, never," said owner Jorge Calvet, who pays $214 a month in fees at the modest condo. "No money ... I don't understand that." Calvet said that after he and another resident, Amparo Macias, began complaining about the board they still got no answers, but they did get lawsuits. 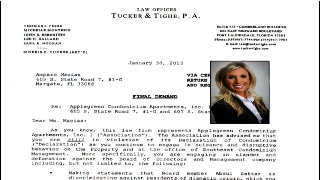 The association's attorneys at the law firm Tucker & Tighe sued both for allegedly having unauthorized tenants in their units. Macias said the association also began towing cars associated with her unit. She produces three towing receipts totaling $600, one for a tire over a white parking line and another for the crime of backing into a space instead of pulling in forward. Perhaps most unsettling, though, were the letters, threatening, discriminatory and anonymous ones written in their native Spanish, some sent under the apparently bogus name "John Kelly." "You are a blackmailer petty thief son of a [expletive] and I defend this country," read one in translation. "Don't say anything. Shut your mouth. I am going to report you to the police." "Right now give this apartment to the state," read another. "I am going to make sure they take it from you and they put you in prison. Do not tell anyone. Colombians are sons of [expletive]. We do not want you around here ... I am going to make your life impossible." It has never been established where those letters came from, and the board said it had nothing to do with them, but the attorney representing the residents, Lourdes Ferrer, said she believes it is part of a "pattern of retaliation." "These board members are handling the money for the rest of the community," she said. "They are supposed to be looking out for the best interest of the community, not themselves. They are basically self-appointed dictators." The man at the center of the conflict is Applegreen Vice President Abdul Sattar. Macias others collected more than 40 signatures seeking his removal from the board for allegedly harassing residents. Macias even called police and filed a restraining order against Sattar, claiming he followed her and cursed at her and that she "feared for her life that one day this will get out of hand." In response, the association's lawyer, Sara Noonan, sent a letter threatening to sue Macias for libel, writing that her claims of discrimination and harassment against Sattar were "malicious fabrications" and warning her she would have to reimburse the association's legal fees. Noonan said there has been no retaliation, that Calvet and Macias, who have admitted having visitors living with them, were sued legitimately for having unauthorized tenants, that the board wasn't involved in the anonymous letters. She also claimed that board members had nothing to do with towing the cars, that it was prompted by tow company patrols. Ferrer said she's not buying it. "That part is very clear and obvious that they are trying to shut them up based on the letters and the lawsuits, that's classic retaliation," she said. The next court hearing in the legal war is scheduled for next month.